35g Protein; 4g Fat; 1g Carbohydrate; 0g Fibre. Pour the sauce around the fish and season. Cover and bake for 15-20 minutes. 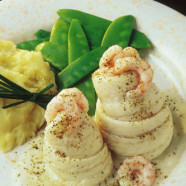 Serve with creamed potatoes and vegetables.